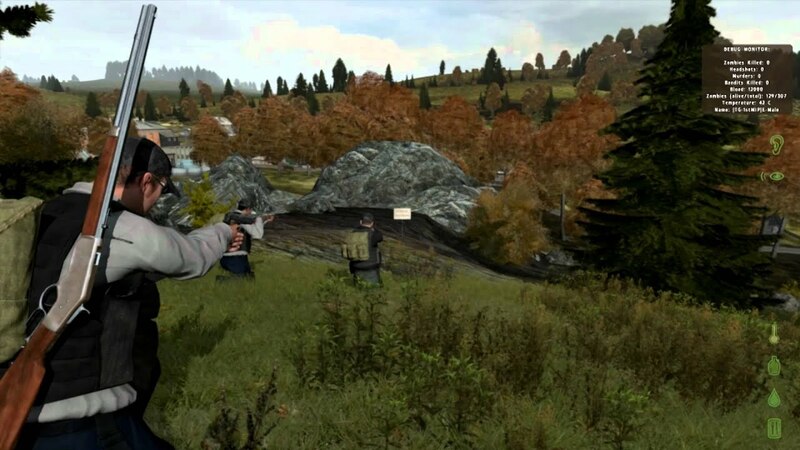 DayZ is set in a region of Chernarus, a primarily Russian speaking area. That means all the maps, street signs and directions are in Russian. Don’t worry, it’s not that big of a deal. The idea is that the general population has been infected and become zombies (or zeds as some refer to them). You are one of the lucky survivors, and you start out at a random starting point with a handgun with some ammunition, a backpack, a water canteen, one or two items of food and some very basic medical supplies. What you do NOT have is a compass, a watch, a map, a flashlight, any other high end goodies such as night vision goggles or a GPS. That doesn’t mean they aren’t out there, you just have to find them… without being eaten. One of the most impressive additions that DayZ brings is the idea of a persistent character. You, the survivor, will collect gear along the way: extra food, extra water, fancier guns, grenades, chemical lights, and medical supplies to name a few. What happens when you log off? Your character is saved. Well, that’s to be expected. But the neat thing that the DayZ developers have done is made your character persistent across ALL servers. Your character is periodically backed up to a DayZ master character server. You can log off Server A and log onto Server B you’ll be exactly where you were when your last save occurred. The mod even provides in-game status to let you know when those saves occur. Sounds interesting? Just wait, it gets better. Let’s talk a little about the Arma2. The Arma2 engine is fantastic. Graphically, it’s beautiful with a persistent world that cycles from day to night on a 24-hour cycle of in-game time. The sun rises in the east and sets in the west. At night, the stars contain astronomically correct constellations including the North Star to help you find your way. There is a lighting difference between a full moon and a half moon. Movement is realistic too. Climbing hills is hard, you can’t run up them. You can sprint but only for short period of time, you have to catch your breath before you can do it again. Running at full height, running while crouched, walking and crawling all give off different sound levels and provide different levels of visibility to the zombies. Is the zombie really close? Drop prone and he might not see you. Are you fairly confident there isn’t one nearby? Feel free to run full tilt, but don’t be surprised if you burst through a tree line and stumble into Zombie Farmer Joe’s cornfield. Of course being a survivor isn’t enough for most people, at least after the first few days. Join up with your friends and band together to investigate and raid the convenience stores, the abandoned military camps, the airfields. You’ll find loot and you can figure out ways to hide what you cannot carry for use later. But watch out! There are bandits out there too, who will just as readily kill the people who are scavenging and take their loot than go through the effort of scavenging themselves. At the writing of this article, there were almost 57,000 people playing this mod with the numbers increasing daily. Over 130 servers have been granted a license to host this mod. Sales of Arma2: Combined Operations (required for the mod) have reached the top of the charts for the past week. Amazon is running a special sale of the game for digital download: Only $15. This is the lowest price ever seen for this amazing game platform. So take the plunge! Join the ranks of the survivors and see if you have what it takes to survive in post-apocalypse Chernarus. The mod can be downloaded directly from www.dayzmod.com and a detailed installation guide and community for the mod can be found at http://www.tacticalgamer.com/dayz/18...mod-setup.html. So I wonder how does TacticalGamer play DayZ ? I love this game. However, it's only fair to mention to any readers that there are some serious problems regarding people hacking and being very malicious. Some of them use simple cheats, such as ESP and vehicle/item spawning, but others are much more evil and do things like slay an entire server, teleport people miles into the air (who then subsequently fall and die), teleport themselves to your location and kill you, turn invisible, destroy campsites, and just generally ruin everyone's fun. I still play it a lot, but since ARMA II is not free, I feel like people aught to know that this game is not "working" the way it should be at the current time. That being said, I would probably buy it again knowing everything I know about it now. I mean it is really a great game.